Why it’s daunting: Despite the fact that he worked as a V.A. 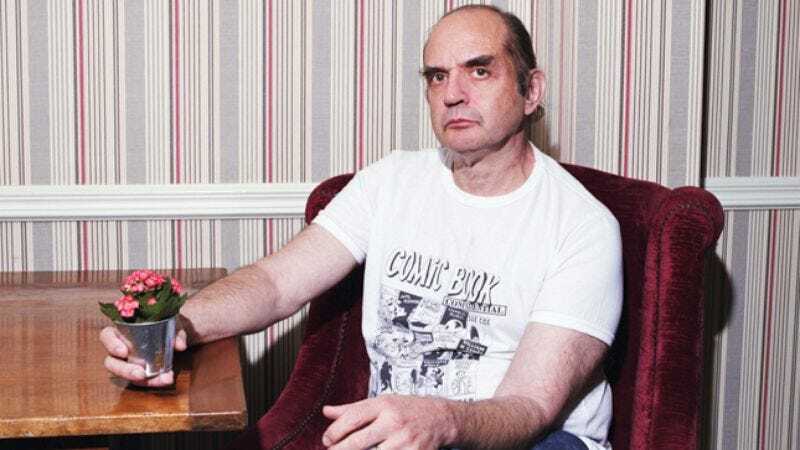 file clerk while creating his observational comic book series American Splendor, Harvey Pekar was a prolific writer, leaving behind several thick anthologies as well as a slew of shorter stories, some collected into single volumes, many not. That Pekar collaborated with dozens of artists inevitably means some stories strike home more forcefully than others, and even the most solid anthologies have their rough patches. Plus, there’s the fact that American Splendor’s stories tend to center on a balding crank with an overriding disdain for most of contemporary culture, not the coziest of protagonists. Why: Value-wise, you can’t beat this reasonably priced, 300-plus page anthology, which collects the volumes formerly known as American Splendor and More American Splendor. (The current cover, with art from the 2003 film adaptation of American Splendor starring Paul Giamatti as Pekar, will cost you the individual books’ R. Crumb-drawn covers, which appear as tiny insets, but you can’t have everything.) More importantly, settling down with a large dose of Pekar is the way to go, since the breadth of his enterprise reveals itself with each new strip. Pekar didn’t just work with a wide palette of artistic collaborators, including R. Crumb, Joe Sacco, Jim Woodring, Chester Brown, Drew Friedman, Eddie Campbell, and the Hernandez brothers; he wrote in a panoply of styles, as memoirist, historian, and a poet of the mundane. One of Pekar’s great gifts as a writer is the ability to isolate such fleeting moments from the course of an ordinary day, the kind we might overlook while preoccupied with the worries coursing through our heads. Pekar’s quite the neurotic himself, but writing seems to serve as a way to step back and savor the fresh-bread-ness of life. In another early strip, Pekar flips through the phone directory, finding others with the same name as himself and tracking their progress through the years as if following his own doppelgangers. In the final panel, he concludes with a shrug, “Who is Harvey Pekar?” The overblown question deliberately mocks the vernacular of superhero comics, and R. Crumb’s art presents Pekar against a blank wall, facing the reader as if going through a stand-up comedy routine. It’s a great example of the kinds of left turns Pekar’s stories often take, drawing their inspiration from the vicissitudes of life or simple the free association of a constantly active mind. Next steps: There’s More American Splendor, of course, another 300-page anthology, but let’s shift gears. Pekar favored the conciseness of the short-story format, its capacity for striking a glancing blow and fading quickly from sight, but he occasionally tried his hand at longer narratives. The best is Our Cancer Year, which chronicles Pekar’s lymphoma diagnosis and the subsequent ordeal of chemotherapy, as well as the strain it placed on his relatively young marriage to Joyce Brabner. Although Pekar took issue with the quality of the book’s printing, Frank Stack’s loose cross-hatching captures the thickening shadows around the couple as they deal not only with Pekar’s cancer but the strain of buying a house and the national upset of the first Gulf War. Stack is one of the loosest artists Pekar ever worked with, and it’s easy to miss the more cohesive draftsmanship of Crumb and Sacco. (The latter illustrated several narrative jazz reviews for The Village Voice that remain uncollected.) In some ways, it’s Pekar’s most traditional, even typical story, but it’s told with disarming honesty, even when it means presenting himself as a whining, pitiable invalid. Our Movie Year, which follows the heady period after the release of the American Splendor movie, isn’t nearly as involving, but it captures Pekar’s hate-hate relationship with the entertainment industry to a bitingly funny T.
Where not to start: The quality varies, but by and large, the work Pekar produced in the years before his death last year is not his finest. (Some of the better volumes, like 2003’s Unsung Hero, are also out of print.) And though it may be too obvious to need mentioning, the graphic histories Pekar produced with Paul Buhle, including The Beats and an adaptation of Studs Terkel’s Working, aren’t American Splendor proper, even if they have their charms. Generally speaking, the best strategy is to start at the beginning and work your way forward, supplementing your reading with YouTube clips of Pekar’s famously cantankerous Letterman appearances and treating his life, and his surroundings, as if they comprised a small, fully formed part of the great American novel.